she's a tiny rocket powerhouse! 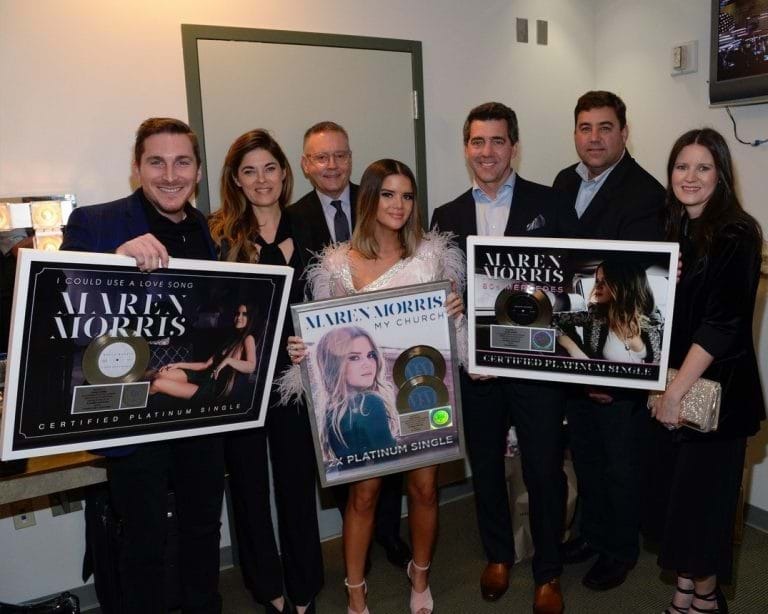 Following her jaw-dropping performance of Aretha Franklin’s “Natural Woman” with folk rock liberator Brandi Carlile, CMT Artist of the Year, the incredibly talented Maren Morris was recently presented with three RIAA plaques celebrating the success singles from her debut album "Hero". Pictured (left to right) John Zarling Executive Vice President, Marketing & New Business Sony Music Nashville; Janet Weir 42 Entertainment/Red Light Management; Randy Goodman Chairman & CEO Sony Music Nashville; Morris; Ken Robold Chief Operating Officer & Executive Vice President Sony Music Nashville; Jim Catino Executive Vice President, A&R Sony Music Nashville; Taylor Lindsey Vice President, A&R Sony Music Nashville.